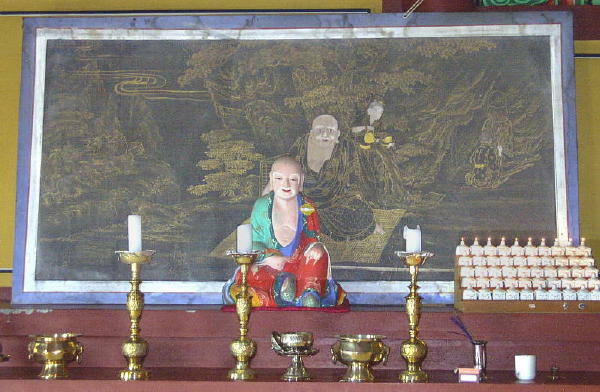 Nobody is sure who first founded Halla-san Gwan-eum-sa, but it existed by about 1700 in the Joseon Dynasty under the name Beob-jeong-am. 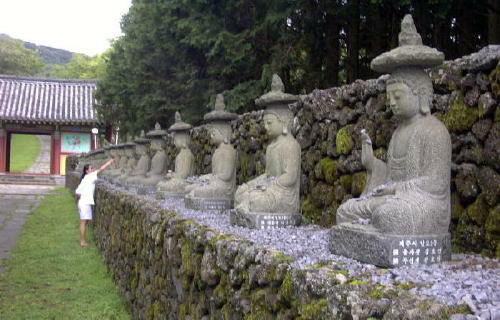 It fell into disuse and ruins in late Joseon, but was recon-structed by monk An Bongno in 1908, as he revived Buddhism on Jeju Island. It was unfortunately destroyed during the Cheju civil war of 1948-50 (the "4.3 Massacre"; it now contains many memorial sites for the victims outside of its main compound. 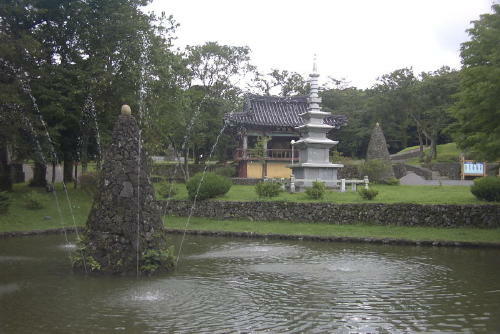 Today its spacious grounds are arranged like a public park, and it is the most-visited temple on the island. 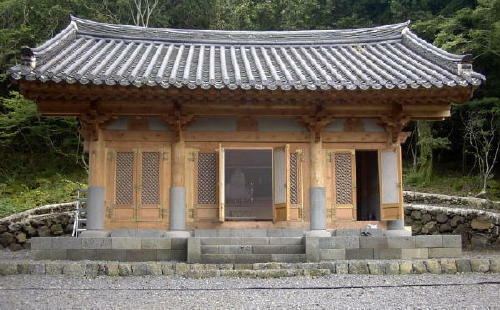 It serves as Headquarters Temple for the Jogye Order's 23rd District (all of Jeju Province). 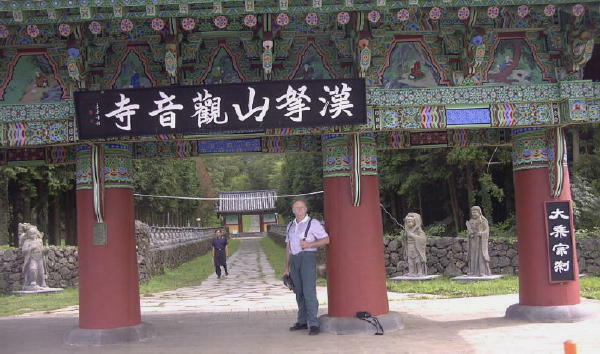 This temple is named for the very popular Bodhisattva of Compassion, called Gwanse-eum or just Gwan-eum in Korea. the slope in the forest, not yet painted. 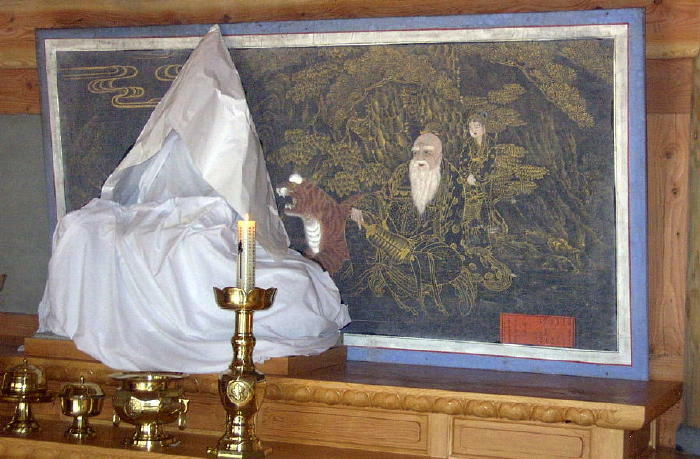 BELOW: the San-shin painting (same one as in 1986), gold-on-black in an echo of ancient illustrations of Buddhist sutras. 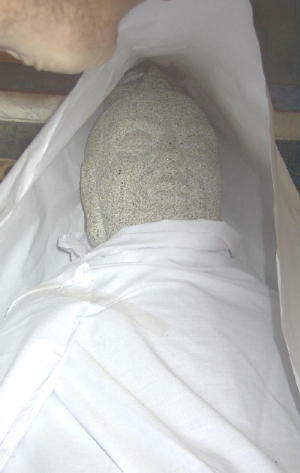 The new granite San-shin statue was Shamanically veiled, still wrapped up in white cloth and paper. Its unveiling ceremony was held in 9/03.